Any title that includes Rainbow is bound to conjure images of crystals and incense sticks. Nope, there’s not a tinkle of glass nor a whiff of sandalwood to be found in this post, only photographic proof that it is possible to see the end of the rainbow, and live a serene life beneath it. 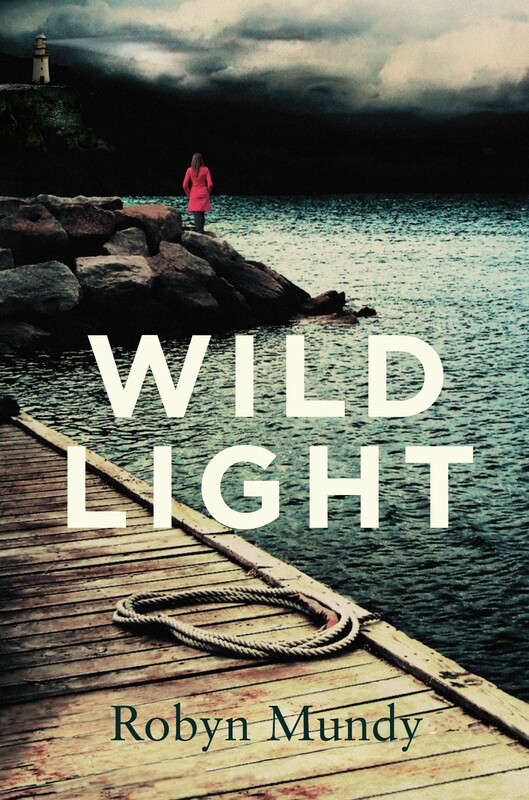 We’re talking Maatsuyker Island, site of Australia’s southernmost lighthouse, the island where my novel Wildlight plays out, within cooee of the south-west corner of Tasmania. Our six months of caretaking and weather observing at Maatsuyker Island has come to a close. Now, even more than our first few days of treading paved roads, it feels like crashing back to earth. The work on the island was hard, the living conditions cold, and the wind rarely stopped blowing, but perhaps all these challenges contributed to us having the time of our lives. And even though we turned into eating machines, we each left the island many kilograms lighter, and fitter, thanks to hauling lawnmowers up and down slopes, wielding brush cutters, digging drains and tending a large vegetable garden, plus all the walking. It’s a win-win formula that I’m naming The Maatsuyker Diet. Here is my partner Gary with ‘Helga’ the mower. There’s little scope for traditional gender roles on Maatsuyker Island. We divided the mowing and brush cutting work that tends a 2-kilometre-long grass road, 2 helicopter pads, 1 vegetable garden, the surrounds of 3 cottages and 1 lighthouse, 1 paddock, and brush cutting 7 bush tracks, paths and numerous slopes too tricky or hazardous to mow. One round took each of us 4–5 days on a 3-weekly cycle. Strawberries from the poly garden. Maatsuyker is not only Australia’s southernmost lighthouse. Bring on Australia’s southernmost strawberry patch! A corner of the Maatsuyker pantry at the start of our stay; strawberries from the veggie garden’s poly house; sushi rolls for dinner (my partner Gary’s speciality); during our stay we consumed 42 kgs flour transformed into sourdough loaves and baked goods. During our first caretaking term in 2010–11 we barely saw another two-legged being, but on this stint we relished the company of several energetic visitors. Long-time friends Katherine and Kevin from Western Australia arrived on a crayfishing boat and stayed for five days. The permits and arrangements took them months, and even then it was nail biting times as the ocean swell and weather was against them both on their arrival and throughout their stay. Katherine and Kev were thankful for the handrails in the howling gales; they very quickly found their footing, embraced nature, and contributed to Maatsuyker with all manner of island work. The wonderful Friends of Maatsuyker stayed over for two intensive working bees. This volunteer group contributes to almost every aspect of the island. Amongst the hard workers was Mark, who has turned his passion for lighthouses into restoring those around Australia that require serious TLC. Mark made his own way down to Tasmania and donated time and skills to continue work on restoring Maatsuyker’s lighthouse. During his days on the island we would regularly cross paths at first light as he headed down the hill to begin his day, working until late into the nights. He made impressive progress by removing damaging paint from a big section of the inside walls, and repainting top parts of the tower. An unexpected visitation came from Dutch presenter-producer Floortje Dessing and her camerawoman Renée, who flew all the way from the Netherlands at short notice to produce a documentary about life as caretakers on Maatsuyker Island. Floortje To the End of the World (Floortje Naar Het Einde Van De Wereld) is a popular Dutch TV series which focusses as much on the people who choose to live in remote corners of the world as it does on the the natural wonders of wild places. While they were on Maatsuyker the girls got to experience the brunt of the Roaring Forties latitudes with 6-metre ocean swells and a record wind gust for January. Maatsuyker claims plenty of ‘personal bests’ when it comes to record winds: still to be beaten is its August 1991 squall of 112 knots (207.4 kms per hour), the country’s highest non-cyclonic wind gust. Floortje and Renée embraced every moment of the weather and were fun to be with. I only learned later how big a celebrity Floortje is in her home country, while to us they were simply two sparkling, energetic women who joined us each evening for dinner, washed up afterwards, brought a whopping great round of Edam cheese in their suitcase and followed us here and there on our daily routines. Lastly we welcomed Tasmanian Parks and Wildlife video competition winner Simon whose prize was a visit to Maatsuyker Island. Simon and his mate Noodle lobbed in for an overnight stay via helicopter, though with under-par weather conditions it was touch and go whether they could even make it to the island. Thanks to the skilled pilots at HeliRes they arrived safely after a short delay. Without losing another minute, the boys donned wet weather gear and bounded from one end of the island to the other with cameras in tow. In the evening, between ducking outdoors to watch a brilliant sunset, they joined us at Quarters 1 for curry and a pint of home brew beer. Next morning at 0400 they were up and at ’em to watch Maatsuyker’s thousands of short-tailed shearwaters launch off the island. In 24 hours Simon and Noodle succeeded in filming and later producing a professional 3-minute video which showcases the island. I will have that clip available to share in a week or so, along with an interview with Simon. I could go on about Maatsuyker, but will close with the info below and a selection of photos which I hope express the magic of the island. The volunteer caretaker program is coordinated and managed by Tasmanian Parks and Wildlife Service who currently advertise the position through Wildcare Inc. every two years. Each applicant must demonstrate a range of skills and an adequate level of physical fitness, and will be responsible for purchasing their own provisions for the six-month term. Part of the Maatsuyker caretaker duties is to conduct daily weather observations for the Bureau of Meteorology Hobart. Many short-term volunteer caretaking opportunities across Tasmania are advertised through Wildcare Inc., the incorporated community partner organisation that provides management and support for volunteers working in natural and cultural heritage conservation and reserve management. Friends of Maatsuyker Island (Wildcare Inc.) is a volunteer group who contribute time and skills to the island, raise funds towards maintenance and improvements on Maatsuyker, run day trips to the island via boat, and conduct annual working bees. I loved reading your blog of your Maatsuyker adventures. Must be a tough place to leave. Loved all your food produce – well done to making it even more of a home for the people fortunate enough to go there! Great waving to you from afar too!! Made it real to know you really were there on that amazing southern outpost! Glad so see you are back and healthy and had a great experience. I really enjoyed reading about it, having been very firmly planted in the Boston suburbs for the same six months. It seems the natural world is still out there and magnificent, while the “civilized” world has stumbled along miserably for the same six months. hope you got some good writing, thinking and dreaming in, and welcome back to the blog! best. Dan. Thank you, Dan. I have seen your Trump headlines and have to confess to being glad to be distanced from Trump news these last 6 months. Plenty of fodder there for a satirist of your caliber! How goes your other writings? yes, plenty of fodder for satire but…i gladly pass on the opportunity for a little more humane and sane leadership :(. i cannot properly put into words the shock of November 8th. as to other writings, my (serious) novel came out in December, and I’ve gotten a couple of related pieces and interviews placed nicely – with publisher’s weekly and psychology today. also readers seem to really like it, which is quite gratifying. as you know of course, getting ‘noticed’ is still a long-shot. but so long as readers respond to it, there’s always a chance. Congratulations and Bravo, Dan, on the new novel. What a good feeling, and to have it talked about in PW. Can you tell me the title? (I did a search but could find only an earlier novel). Thanks Robyn. Of course. It’s called, “The Feet Say Run”. Should be there on Amazon. I’m really proud of it. So strange that the other was the one that got the big deal and advance etc. this is such a more complete book, and honestly has a much broader appeal. oh well. Beautiful photos and overview of your stay, Robyn. I’m more than a little envious—I can’t wait to be ‘unencumbered’ and free to roam again. I hope you got lots of writing done! it was a fantastic experience. Best wishes throughout your pre-publication stage: it’s amazing how, with time, all the effort of those many drafts transforms into a feeling of accomplishment. I can’t wait to hold a purchased copy in my hands! Welcome back Robyn, I was just thinking about you yesterday and wondering how soon you’d be back on the mainland 😀 Photos are wonderful. Maatsuyker sounds like a magical place. Thanks for your nice words. I am looking forward to hearing more about your creative project! Thanks Amanda. We feel lucky to have had a second chance on Maatsuyker Island. I wondered how it all went in the icy south. Excellent to hear it was fabulous. Your head must be spinning if you only returned on Monday. Nice to reconnect with you. Wow, what spectacular photos Robyn! Some incredible scenery there and that rainbow picture is awesome. And what a view from your writing studio, I’m betting you had heaps of inspiration during your stay! It truly does look like a beautiful and magical place. Looking forward to seeing more pics and hearing about your time on the island. Thanks, Sue, for those kind words. Maatsuyker certainly is special, in every kind of weather. Thanks for checking in! Hi Robyn and Gary, Thanks for sharing your wonderful log and photos of your Maatsuyker stay. Thanks for your interest and comment. It was wonderful to have Amy in this corner of the world. She seemed to love every moment of her Tasmanian holiday! What a magnificent experience! I imagine your feelings about returning to ‘civilisation’ are very mixed. Lovely to have visits from friends and helpers too. Did you have time to do any writing? It certainly was an experience. I did take some cask wine but was on strict rations. I also took some mini bottles of champagne and rationed myself with one each Saturday night, being our homemade pizza night (our big night out). It’s astonishing how delicious everything tastes on an island. Thanks for your comments!